I moved to Rodez, a city which is located in the Aveyron. This state belongs to the south od France where people have a singing accent. My office-bedroom-kitchen is not big. I mean, it is small (15 square meter) for a couple. I don't know how long will we manage it well. Currently, we are trying to keep it clean and workable...But it is time consuming. Therefore, we don't want to stay too much inside which is good since it leads us to do many activities. Aujourd'hui, j'ai décidé d'investir dans du lourd. Une machine à coudre de professionnel avec laquelle les coutures des Slacks devraient atteindre la perfection. Plus de chichi, mes premiers bénéfices viennent d'être investi. Je vais continuer à manger des pâtes encore un peu alors que les slacks vont goûter aux joies de la haute couture. D'après mes recherches, ma machine est la terreur du bartack (type de couture haute solidité). A priori, la cadence de piqûre est si élevée que la sangle en chauffe! Hâte de voir les premiers résultats! HLK-03electronic bartacking machine is a new product manufactured with Mitsubishi licence, which is equipped with Mitsubishi control system and high precise stepping motor. 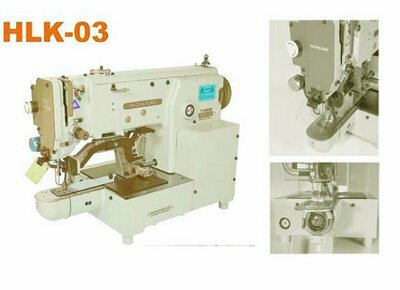 It has 16 bar tacking patterns in memory, but with its optional digital pattern input device, any sewing pattern up to 9999 stitches can be enacted. This product features beautiful stitches, easy operation, wide application and high efficiency and is a must for high quality garment products.